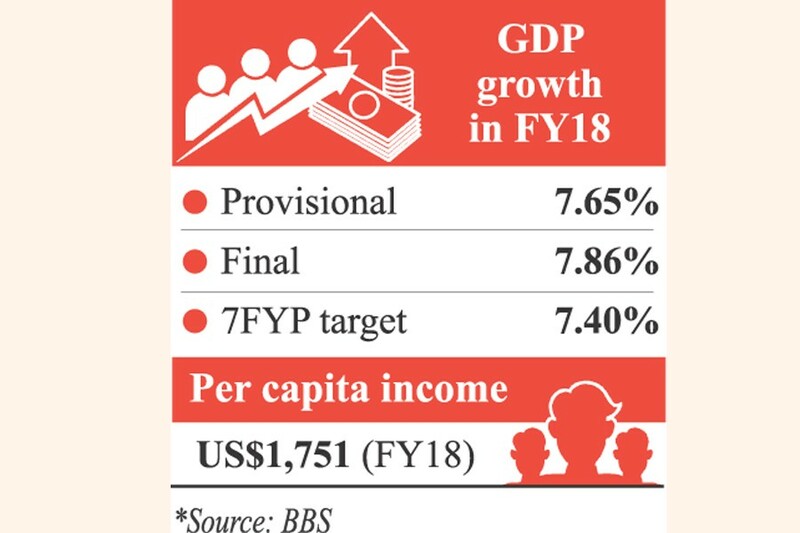 The country's economy expanded at a rate of 7.86 per cent in the last fiscal year (FY) 2017-18, propelled by its industrial and agriculture sectors, the final data of Bangladesh Bureau of Statistics (BBS) showed. The final Gross Domestic Product (GDP) growth was 0.21 percentage points higher than 7.65 per cent, the government's previous estimation, unveiled in May. However, the country's per capita income dropped by US$ 1.0 to $ 1,751 in the FY 18 in the final estimation, according to BBS. In May, the BBS estimated the provisional per capita Gross National Income (GNI) at $ 1,752. Planning Minister A H M Mustafa Kamal presented the final GDP data on Tuesday. He was briefing journalists after a meeting of the Executive Committee of the National Economic Council (ECNEC), held at the Planning Commission in the capital. The country's GDP growth at constant price broke all its previous records, as the rate has been on a steep rise after Bangladesh entered the "7.0 per cent growth club" two years ago in FY 2015-16, officials said. In the FY '16, Bangladesh's economy expanded at 7.11 per cent rate, emerging out of the "6.0 per cent growth trap" after nine years. According to BBS final data, the country's total GDP size at current prices rose to Tk 22.50 trillion ($ 274.11 billion) in the FY '18. In the FY '17, the total GDP size was Tk 19.76 trillion ($ 249.72 billion). The Gross National Income (GNI) also increased to Tk 23.53 trillion ($ 286.612 billion) in the current FY from that of Tk 20.607 trillion ($ 260.45 billion) in the previous FY. GNI is calculated incorporating the total remittance inflow to a particular country with its total GDP in a certain fiscal year. According to BBS GDP data on constant prices, the industrial sector expanded at a rate of 12.06 per cent in the FY '18, which is 0.15 percentage points higher that the provisional estimation of 11.99 per cent. In the FY '17, the rate of industrial growth was recorded at 10.22 per cent. According to the final estimation, the agriculture sector expanded at a rate of 4.19 per cent, whereas the provisional projection was 3.06 per cent. The agricultural sector growth in the FY '17 was 2.97 per cent. However, the growth rate of the services sector was lower in the current fiscal, 6.39 per cent, compared to that of 6.69 per cent in the previous fiscal, the BBS data showed. According to the provisional data, the service sector expanded at 6.33 per cent. The industrial sector's contribution to the economy at constant prices increased to 33.66 per cent in last FY from that of 32.42 per cent in the FY '17. However, the sectoral share of the services sector and the agriculture sector fell to 52.11 per cent and 14.23 per cent respectively in the FY '18 compared to 52.85 per cent and 14.74 per cent in the FY '17. The investment-GDP ratio rose to 31.23 per cent in the final estimation for the last FY, compared of that of 30.51 per cent in the previous FY, the official data said. When asked about the higher GDP growth, the planning minister said: "Private investment has been the engine of growth. The present government under the leadership of Prime Minister Sheikh Hasina has been able to attract more investment (to the country)." The impressive growth in industrial and agriculture sectors prompted the country's higher GDP growth, he opined. About the fall in per capita income from the provisional estimation, he said the income decreased slightly in the final calculation, as taka depreciated against the USD.